If your crafting space is constantly stuffed to the brim, use these tips to bring the clutter under control so you can have more time to make or finish project, instead of curating supplies. Choose a Storage Container System and Don't Allow it to Overflow! Visible storage works best, and storage containers should always keep out moisture and dust. 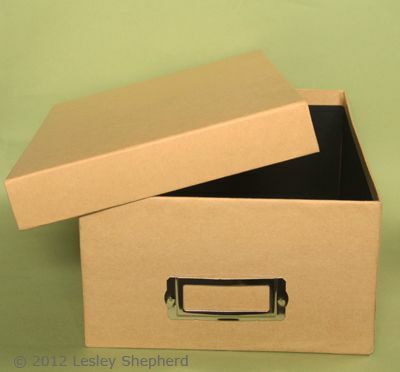 Label your storage clearly and keep records (or samples) in a book of papers, fabrics and other items you have stored which you may want to access. It is easier to flip through a book to check on fabrics for doll clothing, finding a list of the doll and patterns that go with it, than to pull out three boxes in your stash. Try to keep items for a particular project together so you don't have to deconstruct your work space to find that special item you squirrelled away three years ago. Remember you have to become the curator of everything you collect, so collect only items you have a use for. Avoid becoming a collecting magpie if you want piece of mind or a clutter free work space. Custom colors of polymer clay for miniature projects can all be made from blends of different amounts of primary clay colors. Photo copyright 2009 Lesley Shepherd, Licensed to About.com Inc.
Polymer clay colors can be so alluring, and they don't cost much to buy. If you buy every color that appeals you'll soon have overstock, and projects based on factory colors which lack true artisan appeal. You can mix any color you will need in polymer clay by learning to blend three primaries, and adding white or black for tone and shade, add in a translucent clay and you can make all the custom colors you need from six packages of clay. You can use red, yellow blue primaries or cyan, magenta, yellow. Try to find 'pure' colors rather than colors which have been softened with white, you can add your own white into the mix to adjust clear primary and secondary colors if you wish. Best primary colors vary by brand. Want even more freedom? buy your own mica pigment powders (like Jacquard Pearl Ex powders) to mix into polymer clay for metallic clays. The mica powders can also be combined with many other craft materials including paints, varnish, or acrylic mediums to add metallic effects as paint finishes, to epoxy putty, air dry clay or other materials for special effects. Artist's mediums, gesso, tar gel, soft gel, molding paste, are the basis for special texturing effects across a wide range of materials. Add acrylic paint to color medium or soft gel mediums and you can make fast icing colors to apply with a syringe or fine applicator. Light molding paste or coarse pumice gel can be used to create stucco and other exterior effects. If you are working on a large project, and aren't sure how much mixed material you will need, measure carefully as you work out your initial color, then you can recreate the same "recipe" when you need more. Veritas Carver's Knife for use with disposable scalpel and hobby knife blades. Photo copyright 2010 Lesley Shepherd, Licensed to About.com Inc.
For many cutting and carving tasks in miniatures, including working with paper, and miniature furniture, you need a sharp fine pointed blade. Scalpel blades are easy to source, come in several shapes good for many tasks, and are generally less expensive to buy than proprietary craft blades. Choose a tool handle which suits your working style. On the other hand, if you will only ever be cutting paper, choose a quality swivel knife which will follow tiny curves. Glues deteriorate over time and under some temperature and humidity conditions, only buy as much as you will use in a three month period, and store your glue properly according to the type. Try to avoid buying a wide assortment of glues unless you need a particular formulation. Make sure you have the proper glue solvents on hand for plastic weld glues or cyanoacrylate glues. PVA glue, thin epoxy putty (for china and metal) and methylcellulose (for paper) are the main glues for miniatures. Add in a plastic weld glue if you use plastic sheet or make plastic models and you should be set for almost anything. I tend to avoid hot melt type glues, but if you need to use them, make sure you have a hot knife or similar tool that will cut through / remelt the glue if necessary. Experiment with and record your doll house room designs on room sample boards. Photo ©2007 Lesley Shepherd, Licensed to About.com Inc.
A lot of overstock in craft supplies comes from buying on whim, or without a project in mind. If possible, plan your projects using the storyboard sheets in the dollhouse record book. This can be a way to keep track of items you have, and items you still need for a particular project. Money Saving Tips for Miniature Collectors has tips for finding particular pieces which also helps to reduce the clutter. If you don't need it now, only buy it if it rounds out a collection or has a place in a future project. If it isn't in a plan, try to keep it out of your craft room! Acrylic Paint comes in many formulations and strengths. Photo ©2007 Lesley Shepherd, Licensed to About.com Inc.
With rare exceptions (some building painting projects) I find it better to keep basic artist's supplies on hand to mix my own custom colors for small painting projects. The inexpensive craft paints from big box stores can be handy, but take up a lot of space in a craft area, and don't have the pigment information or msds information found on art supplies. I use a few basic primary acrylic and tube watercolor paints which can be mixed into a range of mediums for textures and special effects, and which can be chosen based on uv and pigment fade resistance (unlike craft paints). If you stick to an art paint range, colors seldom disappear from the stock available. If you overmix some paints, save the extra paint in artist's cups. These small containers will keep paints workable for months to years. Keep your tools carefully stored to keep your craft and workspace clutter free. Return tools to their storage after each use, once you have cleaned and sharpened or adjusted them. You can use kitchen drawer organizers to set up custom storage for small tools, pens, pencils, modelling and embossing tools, or use the tried and true method of keeping items like paint brushes stored upright in jars or tin cans. Use a method that controls your clutter, but still allows you to easily find (and restore) your tools.